NEW BRITAIN - When it comes to owning and running a business in the New Britain area, it helps to bea member of the Greater New Britain Chamber of Commerce. Located in the CCSU Institute of Technology & Business Development building, the membership-based organization has been the business voice for New Britain for over a half-century. “In general terms, the chamber offers many benefits,” said Timothy Stewart, president of the Chamber of Commerce. Those benefits include competitive health insurance programs, free small business counseling, access to the chamber’s member mailing list and low-cost marketing programs. The Chamber is comprised of various non-profit, manufacturing, health care, educational services and small to mid-sized businesses, and provides its services to more than 400 businesses in the area. The Chamber consists of a 27-member board that includes law professionals, educators, accountants and members of the communications and medical industries. “In conjunction with a strong working relationship with the mayor’s office, the Greater New Britain Chamber of Commerce is able to accomplish various goals regarding the business community and our current and future chamber members,” Stewart said. The chamber is home to a unique partnership with the City of New Britain’s Municipal Economic Development Agency, which works with the chamber on a focused economic development strategy. “The chamber also partners with Capital Workforce Partners, which employs a Future Workforce coordinator to prepare local students to become the city’s workforce in the future,” Stewart said. One way the chamber aims to prepare students for the workforce is through an Innovation Places Planning Grant. Most recently, Stewart met with Rick Mullins, director of CCSU’s Institute of Technology and Business Development, Robin Sharp, executive director of the YWCA, and others to discuss the findings of a survey and focus group data that will be tied in to a “master plan” for the tri-town area of New Britain, Berlin and Farmington. 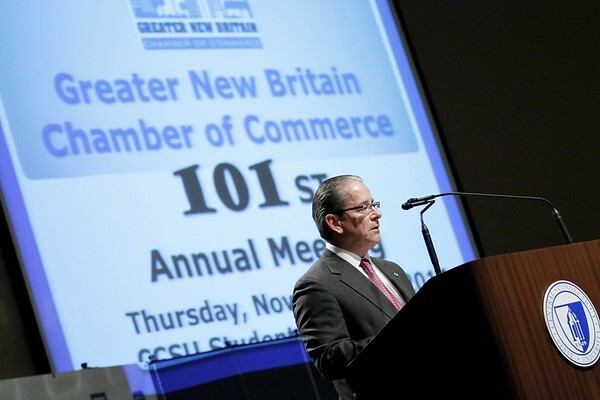 The Chamber of Commerce has been the business voice of New Britain for over a century. Throughout the years, it has provided the business community with various mechanisms to increase customer base, cut business costs, network and partake in marketing opportunities. For more information on the Greater New Britain Chamber of Commerce, visit greaternewbritainchamber.com or call 860-229-1665. Posted in New Britain Herald, Business, on Wednesday, 20 June 2018 12:02. Updated: Wednesday, 20 June 2018 12:04.